I went to Grand Rapids to see my dad last weekend and managed to do a few fun things as well. I arrived on Thursday afternoon and did a lot of cleaning! Then a blog friend and I met for dinner. We had the nicest time and our poor server didn't quite know what to do with the 2 of us!! Thanks for a wonderful night, Brenda. I am looking forward to seeing you again real soon. 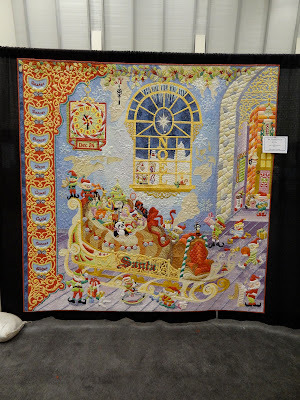 then headed out to the AQS quilt show. There were several exhibits within the larger show. 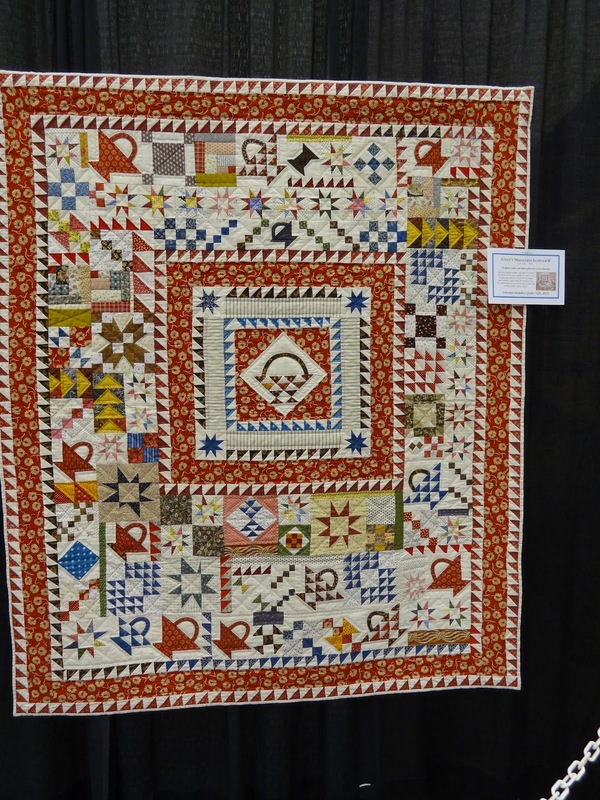 were some of the works of Gwen Marston and the Egyptian tent makers quilts. It was the first time the tent makers had shown their quilts in the US. I have almost 100 pics from the show so I am just going to show a few from the show in this post. If you want to see them all please go to my Flickr and view them. I think you will enjoy the virtual show! All the bird quilts were stunning!! Although the tile looking ones were impressive too! All 4 of these quilts were HUGE! One of the artists was there working away. Notice his tools, and the backing cloth. There were some beautiful Japanese quilts but these two were my favorites. Check out the quilting on the dragon quilt. Then there was the Gwen Marston exhibit. 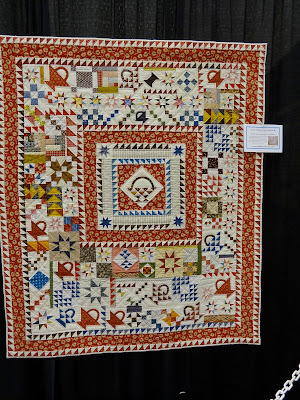 Some of the quilts were made by her and some inspired by her. 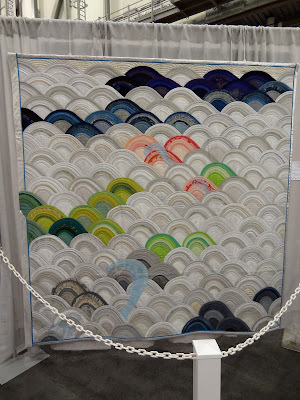 The quilt called the Loading Dock was there and it was stunning!!! I could not even believe how many pieces were in this quilt! Fantastic! I thought this one was so original and FUN!!! It's funny but as I have been doing a lot driving lately I saw a scene very similar to this one and thought how it would have made a great quilt. I guess she beat me to it! This flag quilt gave me goosebumps! You know how I feel about Halloween, this quilt was hysterical!! Another very impressive quilt was this street scene, almost like a photo. I bet you want to know if I bought anything right? There were a TON of vendors there. I did buy a few things. On the trip to GR I stopped at Keans in Mason and guess what they had in the clearance bin? You are seeing that correctly, just over 2 yards of this print!!! I picked up a copy of these 2 books at a very good price! I have taken couple of classes with Suzanne Marshall and her applique technique is so good! She was a wonderful teacher too. I aspire to take a class from Gwen someday too. See that little tool in the bottom left? My friend Brenda told me about that. It is a seam ripper with an eraser type end that works to get the loose threads off your fabric after you break the threads with the seam ripper. I am hoping it works!! I HATE picking out those threads, don't you? Of course I can't resist black cats and Halloween but I did try not to go overboard. Just look at that cheeky grin! 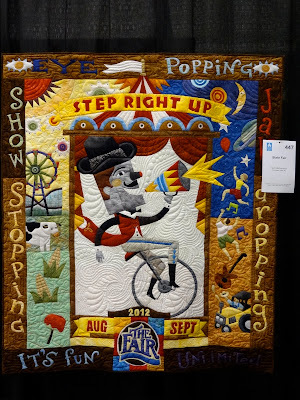 That wraps up the virtual quilt show. I have a LOT more photos on Flickr so hop on over there and take a look. I promise to share that soon. I've been unusually quiet I know but life has gotten crazier than usual. Last Sunday I went to the Checker Distributors open house with Cori and Pauline. I bought a few fabric cards and thought I would share what I bought. And the Madrona Road, if anyone is interested. Now here is the naughty part. I also bought 2 bolts of fabric!! the other one was so freaking adorable I just couldn't pass it up!! Have you people seen Sarah Jane's new line Out to Sea?? I just remembered I did not take a picture of my fabric so it is night time and my pic is kind of bad but if you go here you will see it in it's true color. I believe the pirate girls and the Narwhals will eventually have to join in the fun too. While we were at the open house I got to rub elbows with someone most everyone knows too. Alrighty then, this takes me up to the rest of the week now. I left to go to Grand Rapids on Thursday afternoon and will pick up there tomorrow. I went to see my dad this past weekend. and make sure he is alright. He is 86 and my handicapped sister lives with him so I like to check on them. It would be easier but they live 2 hours away. I had not planned on going to see them this past weekend but I received a call on Wed that there was something that needed my attention so I went. fleeced him out of a good deal of money. He saw her in a parking lot at a store, crying so stopped over to see what was wrong. It all went south from there. I am still dealing with this and that's why I have been more quiet than usual. so something like this will never be able to happen again. OK, that's out of the way, now on to his quilt! 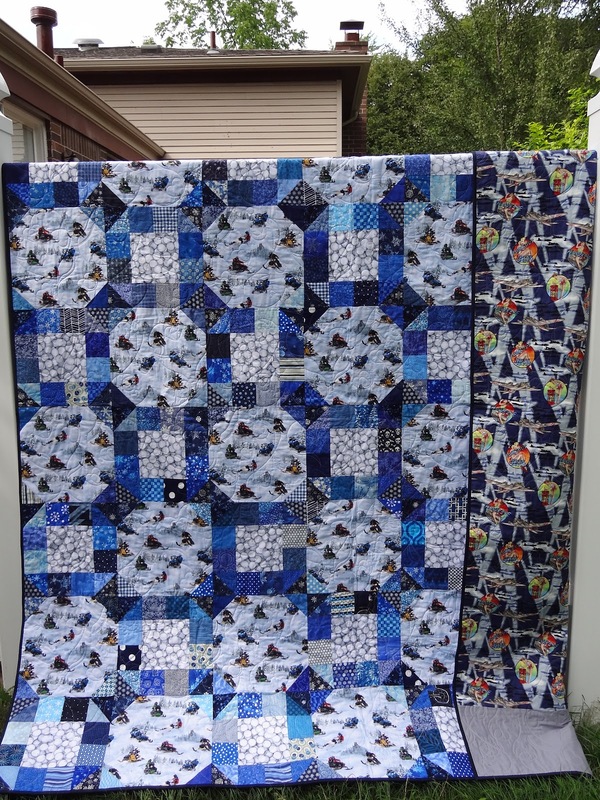 My dear friend, Pauline, had given me a coupon for my birthday to do the binding on one quilt. This quilt is large and Pauline does a wonderful job on her bindings. I thought it would be wonderful to have the binding done by her for a quilt that meant so much to me and I knew would mean a lot to my dad. for persevering and giving me a beautiful finished product to hand over to my dad! like snowmobiling, golf and he was in the Air Force for the Korean war. I had Liz quilt it with musical notes shaped like heart, to represent his love of music. At 86 he still plays the baritone sax, although infrequently now. Liz did a wonderful job! Alright photos, I know that's what you are waiting for! I titled the quilt "All Your Favorite Things"
This shows the front and a bit of the back. Look who was inspecting the back as I was trying to take pictures! Of course this is the BEST photo! My dad with his new quilt!!! to show it to anyone that will listen! He even brought it to the place he eats breakfast. He did ask me how I got the photos of the snowmobilers and the airplanes on to the fabric!! I am happy he loves it. Thanks again to everyone that helped me get this finished for him!! I have been unusually quiet lately but not because I have not been working (among other things). I have the binding and labels done on two quilts. My friend Cori did the binding on Sliced Apples and it looks great!! Cori has an online shop and she is carrying one of my favorite blender lines at the moment called Running Stitches. Hop on over and take a look. Her customer service is also GREAT!! So I bet you want to see Sliced Apples now right? This is the binding and the label. Thank you so much, Cori, for doing the binding and for helping with the QAL. We will have to do it again sometime soon!! 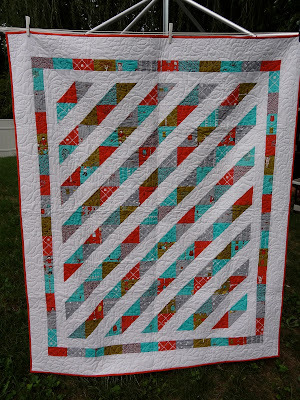 I wanted to show you Liz's fantastic quilting too, using a hairy caterpillar pattern. LOVE IT! Just look at those caterpillars in all their hairy glory! All Finished and ready for ETSY! 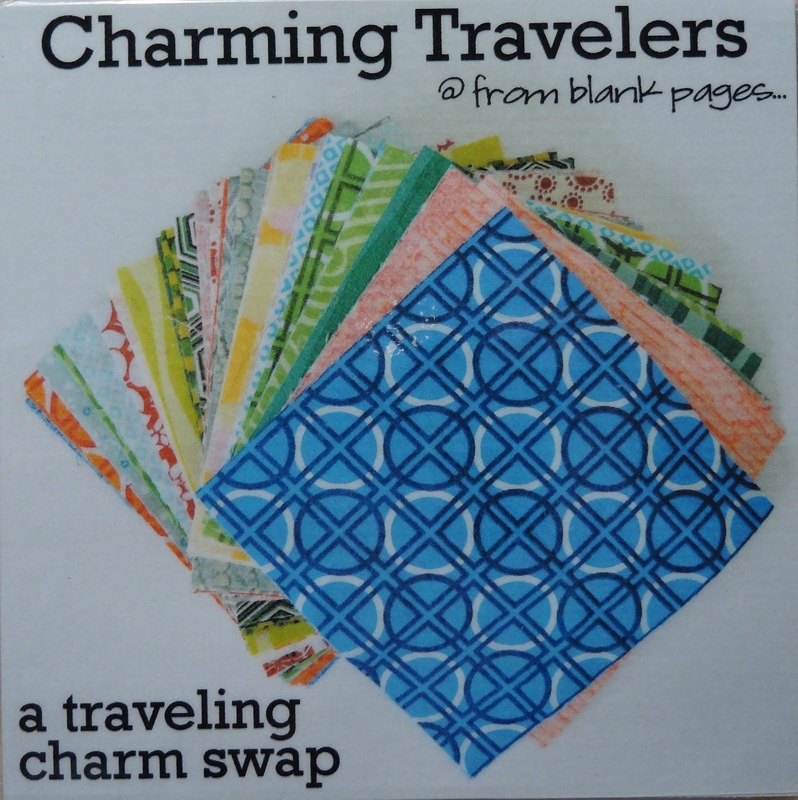 Congratulations, Sara, you are the winner of the Charming Travelers!! Please send me your address and then stop over at From Blank Pages to let her know that you are the winner and to fill out the winner form so she can keep track of where the squares stop!! Thank you everyone that stopped by to play! Keep following the Charming Traveler's for another chance to win.